This is my 17th installment of Babywearing Stories 365. Each installment features a babywearer in 1 photograph and their answers to 5 questions. My goal is to normalize, promote and celebrate daily Babywearing, moving beyond *what* we use to carry our babies and shifting focus back on *why* and *where* we carry. I hope to share the stories of moms, dads, and babywearing caregivers all over the world. Enjoy! Hi. This is me, Sarah. I am a 31 year old stay at home mom. Hardest job I have ever had, but I wouldn’t want to be doing anything else. And I’m wearing my little “toots”. Tessa Christine is my beautiful, smart, funny, 13.5 month old daughter – the light in every one of my days. This is on the Septa Regional Rail headed out of Philadelphia back to our home in Paoli. We had a family day in the city. We were beat! This carrier is the Beco Gemini. It is my favorite carrier of them all. I think a good description is it is a hybrid of the Ergo and Baby Bjorn. No joke, I think I have about 6 carriers and this one just fits us the best. She has been being worn since she was a week old. If it wasn’t for carriers, I don’t know what my husband, Drew, and I would have done. She was not an “easy” newborn, to say the least. She came into the world a month early and literally came out screaming. She wasn’t a colicky baby technically, but if you put her down for even a second, she would start to wail. All the money that we (and others) spent on bouncy seats, swings, and any other thing you would place a baby in was just a waste. Maybe our next kid will get some use out of the never used items? I digress. Our first carriers were the Moby wrap and the Baby Bjorn Air. They both worked well. My husband wore her in the Moby a lot when she was brand new. I, however, was too sore, hormonal and tired to figure out the tricks of it, so I gave up within a hot minute and opted for the Bjorn. It was light, easy, quick and she loved it! She was in it the first four months of her life. Every night, after her 8 o’clock nursing, I would drag myself upstairs to crash in front of the tv to watch House Hunters and pass out. My husband would put Tessa in either the Moby or Bjorn and bounce on a large pink exercise ball. He would put on Mozart or the Nutcracker Sweet and bounce away. Oh and while he did this, he would play Call of Duty on PlayStation with the TV on mute. If he stopped bouncing for even a second, she would start crying. He would stay on that ball until she woke up for a bottle of pumped milk at around 11. Then he would feed her and bring her up to our bedroom and put her next to me in the cosleeper. She was in that thing more than out of it those first four months. It saved our lives! It wasn’t until she could start rolling over at four months that she really tolerated being out of it. So we kept buying more types, especially as she grew (the Bjorn was not great for a baby larger than 15 lbs in our opinion). 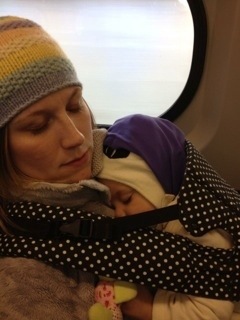 We bought a Hot Sling, an Infantino, an Ergo and then the Beco. The Beco is both our favorites because you can do all four carrier (out facing, in facing, hip carry, back carry). She has always loved to look out, but loves to snuggle in and sleep too. So we thought this one was great because it didn’t limit us and it was very easy, like the Bjorn, to just throw on and it is super comfy and cushy for her. She is 21 pounds now and she is in it every day. It is great for shopping, traveling, walks with the doggies. It goes up until 35 pounds, so I know we will continue to use it for awhile. And I think it will be great for the next child we have because it is super comfy and there is no infant insert required. I wish we would have had it from day one because the back support is great. And being on the ball for all those hours – my hubby could have used it! We had a long day in the city. She is a very active child, always has been, and she was running around the Academy of Natural Sciences Museum and Rittenhouse Square like a mad woman. Before we got on the train to go home, we also had a late lunch, so it was just a long day. She was spent and so were we. After lunch, I put her facing in and she was asleep within seconds of walking to the train station. She was all cuddly on me and my quick walking just sealed the deal. I knew because we were out all day, that she wouldn’t get her nap, but I wasn’t worried (nor have I ever been) because I know I can just wear her and she will fall fast asleep right at my heart. I love wearing her because I know that is where she is supposed to be. We always think about the first in our baby’s life – the first time they crawl, laugh, walk, talk…but we never stop to think about the last time they may do something. I often find myself still walking up at 2 am to nurse and some nights, of course, i’m frustrated with her, but then I think – wait, what if this is the last time she wakes up to do this? I don’t want to think about the last time she is going to want me to wear her because tears come to my eyes. These are tears of sadness, but more tears of joy, because I know that my husband and I have always had her where she wants to be – right with us – breathing in our comforting scents and listening to our familiar heartbeats. We have provided a place for Tessa to always feel safe and secure, which is the job of any blessed parent.